The Crane Iron Works were at the leading edge of a wave of anthracite iron furnaces that swept over eastern Pennsylvania from the 1840s through the 1870s. The Crane Iron Works were tied closely to anthracite coal from their origins in a canal and anthracite-coal company. The Lehigh Coal and Navigation Company, organized in 1818, led the exploitation of anthracite coal beds. Seeking to expand its sales in 1838, the Lehigh Coal and Navigation Company offered valuable water-power privileges to any firm that would spend $30,000 to build an iron furnace on the Lehigh River and run it for at least three months using anthracite coal. This offer fostered the organization of the Lehigh Crane Iron Company in 1839, with considerable overlapping of shareholders in the two firms. Thus, the Crane Iron Works started not only as a way to make profits manufacturing iron, but also as a way to increase anthracite sales. The fledgling Lehigh Crane Iron Company faced an immediate challenge–how to make iron using anthracite coal. Other ironmasters had tried to use anthracite coal, with little or no success. 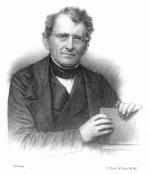 Erskine Hazard, a founder of the Lehigh Coal and Navigation Company, journeyed to Britain and recruited David Thomas who had experience in making iron with anthracite coal. Thomas came to present-day Catasauqua in 1839 and the next year blew in the iron company's first anthracite furnace. The new furnace produced 1,088 tons of pig iron in its first six months, with a peak production of fifty-two tons in one week–much more than a charcoal furnace typically could make. The success of the furnace and growing demand for iron led the company to erect five more anthracite furnaces between 1842 and 1868. These furnaces grew gradually in size, from forty-two to sixty feet in height. The firm also replaced the original water-powered blowing cylinders with a more powerful, steam-powered engine. The company soon became the leading producer of anthracite iron in Pennsylvania, manufacturing 14,272 tons of iron in 1849, fully 13 percent of all anthracite iron made in the state. The Lehigh Crane Iron Company furnaces were joined by a rapidly growing number of anthracite furnaces in Pennsylvania. Anthracite furnaces could produce larger quantities of iron at lower cost than charcoal furnaces could, increasing profits. Expanding demand for iron products, and canals and railroads that provided economical transportation of anthracite to furnaces also fostered the rise of anthracite furnaces. Ironmasters in eastern Pennsylvania, near anthracite coal beds, erected new ironworks centered on anthracite furnaces, or, like Henry Robeson they tore down charcoal furnaces and replaced them with anthracite ones. In 1859, 100 anthracite furnaces operated in Pennsylvania, and their total capacity of more than 212,000 tons surpassed by almost 50 percent the capacity of a shrinking number of charcoal furnaces. The number of anthracite furnaces grew so rapidly that by 1860 they produced 57 percent of the nation's total iron output. Anthracite furnaces in eastern Pennsylvania gradually grew in size. In 1849 anthracite furnaces averaged thirty-six feet tall. In 1864 they rose to forty-one feet on average. Anthracite furnaces also changed in construction, especially as compared to their charcoal furnace predecessors. Ironmasters used brick and then iron to construct furnace stacks, replacing the stone masonry of charcoal furnaces. Specially made fire brick that resisted higher temperatures replaced sandstone linings inside the stack. Several tuyeres blasted air that was pre-heated by hot blast apparatus into the furnace, compared to the single or double tuyere common to earlier charcoal furnaces. Steam engines also replaced water wheels to power the air blast. The number of anthracite furnaces continued to grow, but, during the 1870s, furnaces fueled by bituminous coal and coke eclipsed anthracite furnaces. Just as anthracite furnaces had surpassed charcoal furnaces with greater output and lower cost, bituminous coal and coke furnaces outpaced anthracite furnaces. In 1875 western Pennsylvania bituminous furnaces exceeded the production of eastern Pennsylvania anthracite furnaces for the first time. 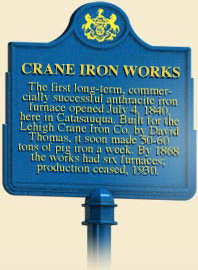 The later history of the Lehigh Crane Iron Company roughly paralleled that of anthracite furnaces generally. After 1868 the firm replaced earlier furnaces with new, larger anthracite furnaces. The company also adopted more powerful blowing engines and other technological improvements. However, it could not meet competition from steel mills and bituminous coke furnaces. The onset of the Great Depression spelled the end of the Crane Iron Works, as the last furnace went out of blast forever in 1930.